One of the most popular projects assigned in religious education programs is a research project on the saints. Confirmation candidates almost always have to do some research on their Confirmation saint and many Catholic school teachers find such research to be very valuable in supplementing the lessons of the year. Excellent source of facts about each saint with some short life summaries. It is the best place to find information on patronage and important dates. Short summaries of the lives of thousands of canonized saints and beati. Another great source for basic information about the saints. 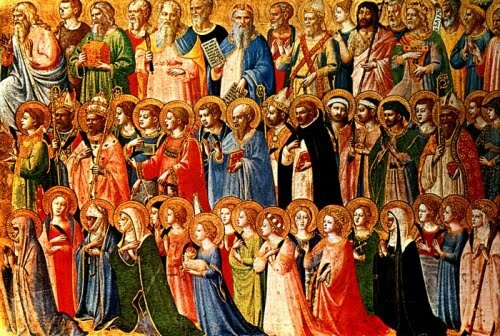 Various links to books, articles, and more about the saints. Since 2006, Pope Benedict XVI has dedicated his Wednesday Audiences to catecheses on the saints from the Apostles to the present day. Have students debate certain issues from the perspective of their saint. Have students lead the class in a prayer written by their saint. On what basis should their research projects be evaluated? This will depend on the format that you are asking students to present their research. Make sure you have written rubrics and clear project descriptions for the students. If possible, provide sample “A” projects, “B” projects, etc. with explanations for their grades.